Measures current in a circuit. 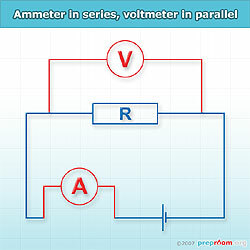 An ammeter is used to measure the flow of electrical current in a circuit. Electrical current is measured in Amperes known as Amps (symbol 'A') and both digital and analogue varieties are available to buy through lab suppliers. Analogue ammeters consist of a moving needle that when connected in an electrical circuit, sweeps across the scale, displaying the amount of current flowing. These types usually have a limited scale such as 0-5A and it is important that the scale reflects its intended use. Milliammeters (measuring in mA) and microammeters (measuring in µA) measure tiny amounts of electrical current flow and can be used to detect the tiny currents produced though electromagnetic induction. 0-1A, 0-5A, and 0-15A ammeters are the most common types found in schools and should fine for most applications. Digital ammeters usually have an LCD screen which displays the current flow in Amps. These too have a limited scale but are usually much greater than analogue meters. Most digital ammeters will go from 0-15A to two decimal places which is usually more than accurate enough for the classroom. 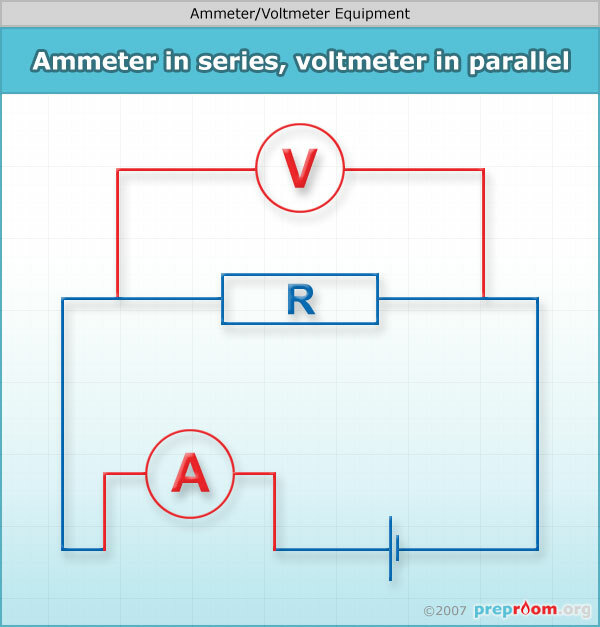 Ammeters whether digital or analogue should always be connected in series, see fig1 with voltmeters always to be connected in parallel. They should always be connected to D.C electricity. Connecting an analogue ammeter to A.C will make the needle move backwards and forward very quickly which may result in damage. Connecting a digital ammeter to A.C will result in the display reading zero because the polarity change is generally too quick to register.